Good afternoon, dear readers, and happy Monday! I hope you enjoyed a wonderful weekend and are getting back into your normal routine this week. Today's blog post continues showcasing my trip to Cosmoprof North America in Las Vegas, spotlighting on the brand LONDONTOWN. Prior to attending the convention, I had heard of the brand LONDONTOWN, but I had not yet experienced the brand for myself. LONDONTOWN's claim to fame is their renowned kur Nail Treatment System, a 5-step system that strengthens, hydrates, and restores the entire nail. The kur system is a naturally derived and holistic approach to nail and cuticle care that was passed down to LONDONTOWN's founder, Natasha Dillon, from her grandmother. Each component of this system works together to improve nail growth and health using the nourishing and restorative properties of rapeseed flower oil, chamomile, cucumber and other essential oils and extracts. In addition to the kur Nail Treatment System, LONDONTOWN also has a line of nail polishes. The lakur Enhanced Color collection uses a 5-free formula with long lasting wear and rich pigmented coverage. I was generously provided with a sample of Camden Chic from their 2014 Spring Collection, and I have swatched it below. Each beautiful shade comes in a box with a little cutout to view the colour of the lakur. The formula of this polish was simply divine, and I wish I had tried this brand sooner! It applied so smoothly and evenly for me. I was also impressed with just how pigmented it was! I used two flawless coats for the photos above. 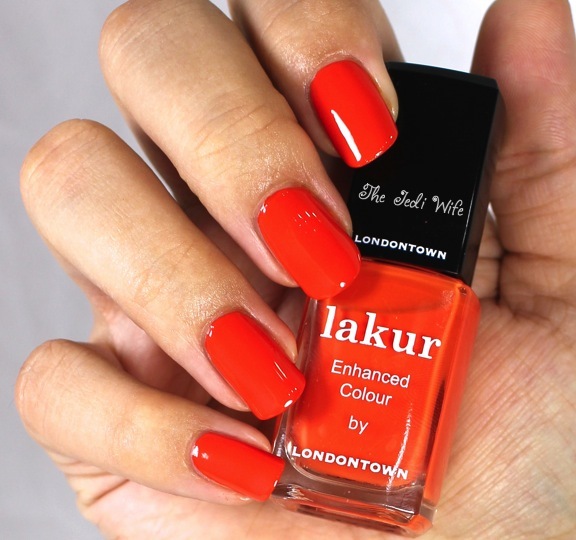 As if being 5-free wasn't enough, LONDONTOWN's lakur is also cruelty-free, gluten-free, and vegan (and all other products for that matter)! It is a brand you can wear proudly, and I strongly encourage you to check them out! The kur Treatment System can be purchased here, either as a complete system or individually. 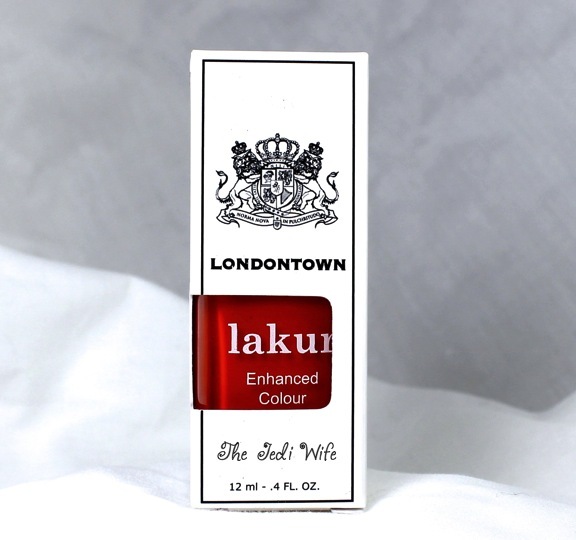 The lakur Enhanced Color Nail Lacquers can be purchased here. Thank you for reading, and I hope you enjoy the rest of your day! XO! That it is! It is the perfect shade of orange for the season! Great Color and so YOU!